Get help setting and meeting your parenting goals with home visiting programs! Healthy Families Indiana expanded services to MIECHV funded families in Elkhart, Grant, Lake, LaPorte, Marion, St. Joseph, Scott Counties based on the Indiana Needs Assessment for the Maternal, Infant and Early Childhood Home Visiting Program dated September 2010. (Healthy Families Indiana is also available statewide through other funding). Nurse-Family Partnership exists in Delaware, Madison, and Marion County under MIECHV. (This program is also available in Lake, Tippecanoe and White counties supported by funding other than MIECHV). No two families are alike. Each family has its own strengths. Every family is special in its own ways. But we can all use a little help when we become parents for the first time or when we’re raising children. Many Hoosier families are learning they can get the help they need through Indiana’s family support programs (AKA home visiting programs) — without having to leave home! Through The Maternal, Infant and Early Childhood Home Visiting (MIECHV) program, pregnant women and families living in several Indiana counties can get the tools they need for better family health and for planning the future of their children. Pregnant women and families can choose from different programs for setting goals in health, positive parenting, and for getting their kids school-ready. It all starts with an assessment meeting, where families and professionals talk about what their family’s needs are. After choosing to be part of a home visiting program, you meet with health, social services and child development professionals who helps you set goals. Thinking of going back to school? Need help jump-starting reading with your little learner? Curious about when the first dentist visit should happen? Professionals can help you navigate all of these issues at regular meetings. Meetings can happen at the family home or at a nearby spot, like a library or even a park. Above and beyond helping families find child care, Indiana provides services that support families facing specific challenges. 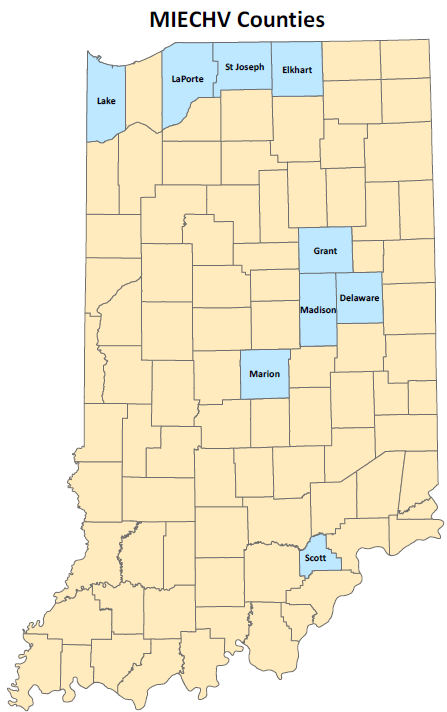 Click here to find an overview of the other services provided by the state of Indiana. What happens at home visits? It depends on what your family goals are. But at each meeting, you learn something new. If you want to learn about different things you can do for better health, your meetings may include information about government resources or clinics close to your house. You might also learn about healthy habits or programs you can join in your neighborhood. If your goal is to get your little one school-ready, you get the tools and support you need to make that happen. Who is doing home visits? As of September 30, 2016, professionals working in health, social services and child development had visited 6,962 families in Indiana through state-supported programs. Through those visits, families in many parts of the state are learning they can thrive with the right tools and support they need. Are you curious about your child’s development? Check out the Developmental Milestones, Screening & Services tool. Many Indiana families are eligible for financial help paying for early childhood programs. Find out if yours is eligible!